Busari "B. J." Raji Jr. (born July 11, 1986) is a former American football nose tackle. He played college football at Boston College. Raji was drafted by the Green Bay Packers with the ninth overall pick in the 2009 NFL Draft. Raji was born in New York City on July 11, 1986, the son to Busari Raji, Sr. and Mamie Raji. A three-year starter on both the offensive and defensive lines at Westwood Regional High School, he earned All-State, All-Conference, and All-County honors as a senior. Raji was also a two-time All-Bergen County Scholastic League choice. In 2003, he recorded 75 tackles, 7.5 sacks, and four forced fumbles. He was selected to play in the 2004 Governor's Bowl, a game played between the top high-school seniors in New Jersey and New York. Considered a two-star recruit by Rivals.com, Raji was not ranked among the top defensive tackle prospects of the class of 2004, which also included DeMario Pressley, Frank Okam, and Glenn Dorsey. Raji chose to attend Boston College over Rutgers and Wisconsin. Raji made the Eagles as a true freshman in 2004, playing in a rotation behind senior Tim Bulman. He made his college debut in the home opener against Penn State, making one tackle. He finished the year with 13 tackles (6 solos) and 1.5 tackles for loss. As a sophomore, Raji started in all twelve games, registering 27 tackles (20 solos), 6.5 tackles for loss, 1.5 sacks, and one pass breakup. He recorded one unassisted tackle against Boise State in the MPC Computers Bowl. In his 2006 junior season, Raji started in 12 games, finishing with 63 career tackles (37 solos), 16.5 tackles for loss, 3.5 sacks, and four pass breakups. He also had three solo stops, including two tackles for loss in the Meineke Car Care Bowl against Navy. 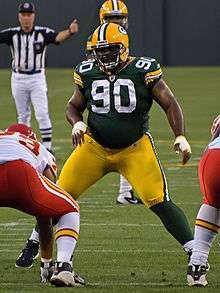 Raji missed the 2007 season due to academic reasons. Returning to the team in 2008, he started on a defense that included Ron Brace, Kevin Akins, Mark Herzlich, Robert Francois, and Brian Toal, anchoring the defense to a berth in the 2008 Music City Bowl. Over his four year college career, Raji amassed 99 tackles (23 for a loss) and 9 sacks, and was named all-ACC twice, in 2006 as a 2nd-team member and in 2008 as a first-team starter. Raji was selected ninth overall by the Green Bay Packers in the 2009 NFL Draft. He was worked into defensive coordinator Dom Capers' brand new 3-4 scheme during the start of the Packers 2009 season, and was regarded as a defensive tackle. 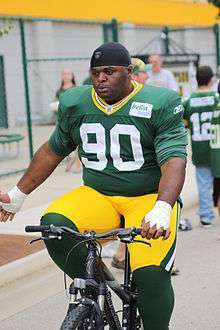 Raji held out during the 2009 training camp and completed his deal on August 14. Hampered by an ankle injury for the entire season, he appeared in fourteen games (once as a starter), and managed 25 tackles and 1 sack. Fully healed and expected to fully contribute for the 2010 season, Raji earned the starting position at defensive tackle in Capers' 3-4 type defense, moving previous starter Ryan Pickett to defensive end. 2010 was a breakout season: starting in all 16 games, Raji became the defensive anchor that the Packers had envisioned, accumulating 39 tackles with 6.5 sacks, along with 3 passes defended. The Packers began using Raji as an additional fullback in their goal-line offense during the 2011 postseason, which led to Raji nicknaming himself "The Freezer" in homage to William Perry, who played for the Bears and was nicknamed "The Fridge". On January 23, 2011, in the fourth quarter of the NFC Championship Game at Soldier Field in Chicago, Raji intercepted a pass from Bears third-string quarterback Caleb Hanie and returned it 18 yards to the end zone, marking Raji's first career interception and touchdown. The 337-pound Raji performed a memorable hula dance after the touchdown, an incident that was parodied in a State Farm Insurance commercial featuring Raji and Aaron Rodgers. The play also broke William Perry's NFL record for the heaviest player to score a post-season touchdown. The touchdown proved to be the decisive score, and with that interception, Packers advanced to Super Bowl XLV, where they defeated the Pittsburgh Steelers 31-25. In the 2011 offseason, Raji was ranked #81 by his peers on NFL Network's Top 100 Greatest Players of 2011, where he was presented by New York Giants center Shaun O'Hara. In early August 2011, Raji was named the co-host of the "In The Huddle" radio show along with longtime Wisconsin sports reporter Bill Scott. The one-hour show airs live from Tanner's Sports Bar in Kimberly, WI near Green Bay. During a Week 11 matchup against the Tampa Bay Buccaneers on November 20, Raji scored a rushing touchdown. He was only the fourth defensive lineman to score a rushing touchdown since the NFL/AFL merger. On December 28, 2011, he was elected to his first Pro Bowl appearance. In 16 games of the 2011 season, Raji registered 3 sacks and 2 passes defended on 24 tackles. The Packers finished the season with an NFL-best 15-1 record for an NFC North pennant, but lost to the New York Giants 20-37 in the divisional round. B. J. Raji against the New York Giants in January 2012. Raji played in 14 games in the 2012 season, making 26 tackles and defended two passes. The Packers' defensive line became short-handed in 2013 due to injuries. Raji was transitioned to defensive end. He started all 16 games at defensive end making 17 tackles. On August 22, 2014, in a preseason game against the Oakland Raiders, Raji suffered a torn right bicep. He was subsequently placed on injured reserve, and missed the 2014 NFL season. On March 30, 2015, Raji signed a one year, $3.5 million deal with the Packers. In the 2015 season Raji totaled 22 tackles and half a sack. 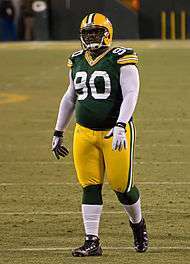 On March 14, 2016, Raji announced his retirement after seven seasons, but noted he would return to the league and that he may simply be taking a "hiatus". ↑ "B.J. Raji Profile - Football Recruiting". Rivals.com. Retrieved 17 April 2009. 1 2 3 "ESPN College Statistics". ESPN. Retrieved 16 June 2011. ↑ "Packers DT B.J. Raji to retire after seven seasons". NFL.com. Wikimedia Commons has media related to B. J. Raji.